I'm taking today and tomorrow off from posting. Over two years ago I wrote an article discussing average teacher pay versus median household incomes per state. That post seemed to generate some interest and discussion. Some of the discussion was criticism based on the apples to oranges comparison between average pay and median household income. I thought I'd both update the numbers and add some more information. The average wage numbers are from the May 2011 state cross industry estimates at the BLS site. The per capita and median income are off of Wikipedia for 2010 which cites the Census. The point of this data is to put teacher pay in relation to general income levels per state. Teacher pay varies considerably from state to state. Income levels in general also vary considerably from state to state. I'm just putting one column of numbers (teacher pay) along side another set of numbers showing state level averages and medians. Teachers earn above average wages in every state except Virginia. Now of course you do have to realize that average pay at the state level includes a lot of people working unskilled jobs with low educational requirements. This is not an apples to apples comparison, its more of an apples to fruits comparison. I think a better comparison would be to look at teacher pay versus the average wages for all people with college educations. However I can't easily find those numbers. Also note that this doesn't look at the value of benefits for a job and teachers have higher benefit levels than most jobs through their pensions and highly funded healthcare. There are four columns of numbers there for each state. First is the average pay for teachers. This is an average figure and includes all teachers of varying experience levels. It may be skewed one way or another if teachers in a given state have high or low average experience on the job. Per capita income is the amount of wages averaged over a population so that includes people who don't work. Median household income includes all households so its a mix of single people, single unmarried parents, retired couples and married couples with multiple children. 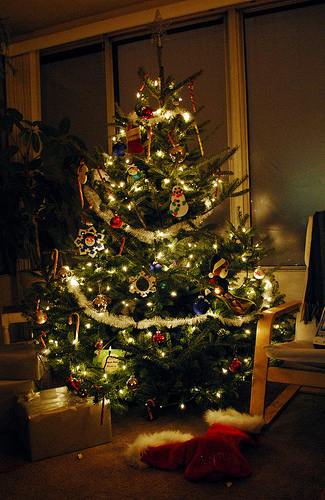 Family income only includes families and does not include single people. None of these are perfect benchmarks for teacher pay versus other occupations nor does this say anything at all about whether or not teacher pay levels are 'fair' or the like. I'm not saying teachers make too much nor too little. We're just looking at the variation in pay for teachers from state to state and putting that into comparison with general wages per state. DoughRoller discusses What is the Saver’s Tax Credit? This is a little discussed income tax credit available to a lot of people to help boost their retirement savings. FMF asks Should Americans Be Forced to Save for Retirement? RiteAid is giving out 25 free 4"x6" photo prints on their website if you use the promo code EPRINT. You can order the prints online and pick them up free in the store. Its probably a limited time offer but I am not sure when it expires. What Percent of People file 1040, 1040A or 1040EZ? 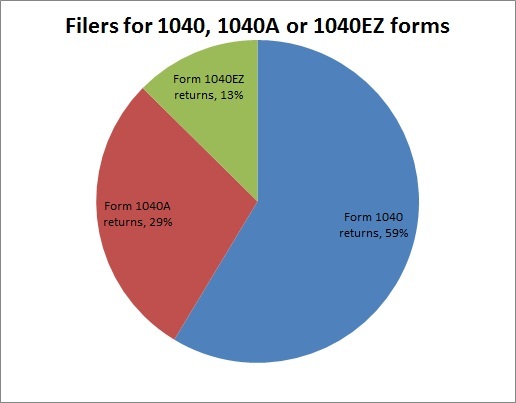 When you think about filing income taxes you generally think about the 1040 form. Thats the 'long form'. There are also two shorter versions the 1040A and the very simplistic 1040EZ. A large percent of the population doesn't do the 1040 form. I got the numbers from the IRS 2010 tax stats. I was actually surprised that more people don't file 1040EZ. For a lot of people taxes amount to a W2 for income and their standard deduction and exemption. How Much More Expensive is Organic Food? Last week Retire By 40 questioned Are Organic Foods Worth The Premium? While organic foods are still only around 4% of total food sales, a growing number of people buy organic. But a side topic of that discussion is : what IS the actual premium cost for organic? Or to put it another way: how much more expensive is organic food? I thought I'd answer that question with a example of various organic food prices compared to the typical non-organic options. The prices are the cost per ounce except for eggs which is the cost for a dozen. I simply grabbed some prices from Safeway. Unfortunately Safeway didn't list the produce so I don't have prices for fruits or vegetables. This is just a sample of prices and only meant as an example. Of course these prices will change over time and vary from store to store. As you can see in the table the premium for the organic foods varies based on the kind of food. Some organic options are only ~30% more while others are 3-4 times as expensive. It may make a little more sense to look at a grocery bag full of food. If you went to the grocery store with the above list and bought everything in typical quantities then you'd spend a total of $24.30 for the regular foods and $44.06 on the organic versions. Thats an 81% total premium for the organic grocery list. 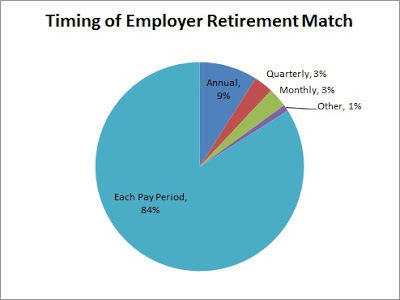 As you can see the vast majority of employers simply make the matches along with your regular paycheck. However a minority of employers like IBM and my company make matches at different periods. they also loon at a couple housing cost metrics with Are Houses Cheap Right Now? RetireBy40 asks Are Organic Foods Worth The Premium? Most senior citizens, aged 65 or older, have relatively low household incomes. Median household income for people over 65 years is just $33,118 compared to a median of $50,054 for the entire population. The census data breaks it down into chunks of $5,000 up to $200,000. But I'll show it in fewer chunks to simplify. 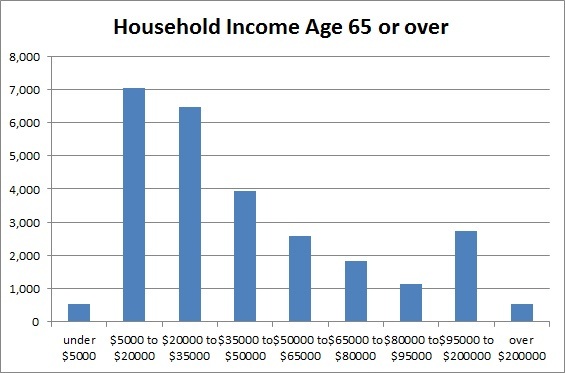 50% of senior households have income between $5,000 and $30,000. 18% of seniors make under $15,000 a year. 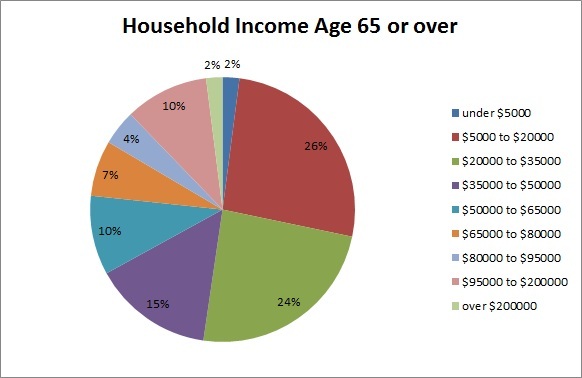 11% of senior households have incomes of $100,000 or more. At the top, 2% of seniors take in $200,000 or more. Several personal finance blogs are currently having contests to win $2,500. The list of blogs with links are below. 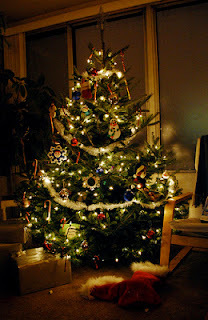 To enter the contests you have to sign up for the blogs email feed and fill out a short survey. Fairly good odds to win some money across all these contests. Some good blogs there I regularly read #2 and #6 myself. You have to sign up for Bckstgr then link to Facebook, Twitter and Foursquare to get all 1000. If you don't want to link to services then you can get 400 miles for simply signing up. Just like them on Facebook and do a survey. What Percent of Tax Filers Itemize their Deductions? The other day someone on The Simple Dollar asked about cash donations to churches and Trent pointed out that most people do not itemize their deductions. I'm not sure if thats common knowledge or not but most people do NOT itemize their taxes. Whats that mean? It means that they do not get any tax benefit from deductions like home mortgage interest, property taxes, charity deductions, medical expenses or the other misc. items that you can deduct as itemized deductions. When we file our taxes we take either the standard deduction or the itemized deduction depending on which one is higher. So if someone takes the standard deduction then they either don't have any itemized deductions to claim or they add up to less than the standard deduction. How common is it to take the itemized deductions? 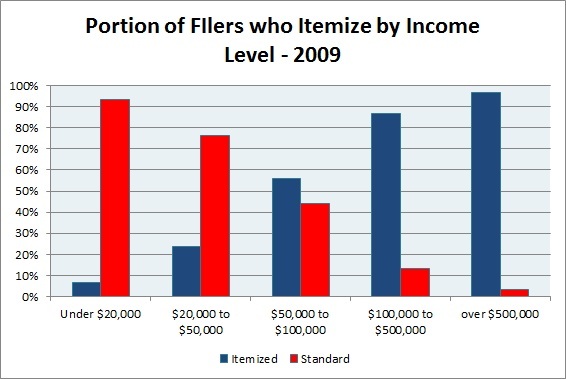 In 2009 about 33% of tax filers claimed itemized deductions and the other 66% took the standard deduction. The rate that filers itemize deductions is going to be lower for lower income individuals as they are less likely to have high expenses. Higher income people are more likely to itemize since they have a lot more expenses. Note, to make the graphic more clear I didn't include the approximately 2.5 million tax filers who had negative income levels. Thats a pretty clear trend. Of course there are always notable exceptions, but by and large the low income people take standard deductions and highest income earners file itemized deductions. That was me driving the 1960's era car with a V8 when I was 17 years old. At the time back in the 1980's I had one of the fastest cars in school. I remember timing myself doing 0 to sixty at around 8 or 9 seconds. 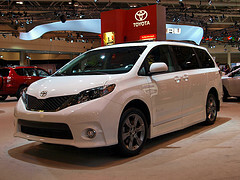 But that Sienna minivan goes 0 to 60 in under 8 seconds. At least according to the site Zero to 60 Times as well as Edmunds testing at 7.9s. I like watching Motorweek on TV and I've been casually shopping around for my next car. I'm struck how talk of performance and horse power has shifted over the years. 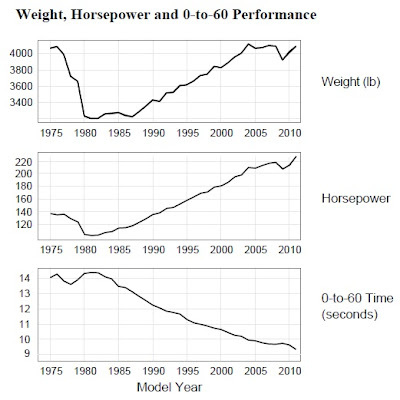 If a car has under 200 horsepower it seems as if its deemed lacking and going 0 to 60 over 9 seconds is considered poor performance. Yet just 20 or 30 years ago these numbers would be considered good for a performance sports car. Do we need more horsepower today than we did when I was in high school? I don't think so. In fact I can only recall twice in my life that I really felt I needed more horse power. Once was driving a 1980s Dodge hatchback with a 1.7L Volkswagen engine that put out a whopping 75 horsepower. I was trying to merge on the freeway after stopping on the shoulder and had trouble getting up to speed without getting run over. 75 horses just couldn't do it. The other time was driving a 1996 Kia Sportage as a rental car up a hill on the freeway. That Kia had 130 horses. By comparison I drove a lighter Dodge Neon for many years with 132 horses and it was plenty fast and had more then enough power to sprint up that same hill at highway speeds. My thoroughly average 2004 Toyota Camry has 157 horsepower and gets along just fine. That 60's muscle car had plenty of horses and in fact it felt at times like it had too much. Yet todays modern cars are faster with more and more power. 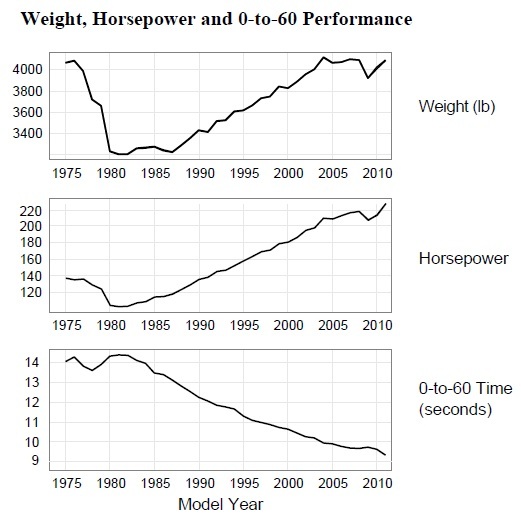 As you can see cars have gotten more and more powerful and the performance has gone up at the same pace. Todays supposedly 'sluggish' Toyota Prius would be far faster than the average car of the early 1980's in a 0 to 60 race. Why do we need more power today? Simply put : we don't. People want more power but in general we do not need it. Sure its fun to drive around in a fast car with a big engine, I'm not denying that, but the idea that we 'need' more power is wrong. Your typical subcompact or hybrid is actually plenty powerful for normal daily driving uses. Now of course there are exceptions where more power is of real use such as heavy duty trucks for construction or towing a big boat or something like that. But I'm thinking of the typical driver in a family sedan with over 200 horses like the 2013 Hyundai Sonata that boasts 274 horses. Thats about 75% more power than my 2004 Camry, which is simply unnecessary. Next time you're looking to buy a car don't get stuck in the idea that you 'need' a more powerful car. Todays average cars have more than enough power and in fact the below average cars do too. Personally I think the 155 hp in my Camry is just fine. How much horse power do you think you need? I think one common problem between a couple is that they may have quite different financial priorities and may not even realize this. This can easily lead to tension and arguments because you both mistake how important some things are to the other. Its important to have a clear idea of where your partners financial priorities are. Their priorities may differ from your own priorities. You may have an idea that your spouse considers some things more important than you but you may not have a clear idea of exactly how important they consider it. Maybe you get into an argument about whether you should pay down a loan or put some money in the bank. Its helpful to know if your spouse considers paying down debt to be their number one priority or if they think money in the bank should be the first goal. 1. Each of you take a piece of paper and then write down your top 10 financial priorities in order of most important to least important. 2. After you've each created your lists then swap the lists and compare. You may be surprised what your spouse considers higher priority. Hopefully you're mostly on the same page as far as priorities but theres likely to be some notable differences. After this exercise you should have a better understanding of your spouses reaction to some spending and saving decisions. I rarely delve into couples advice but I think this one is particularly useful.